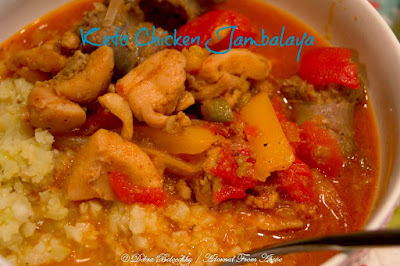 Today I am sharing a Keto Friendly recipe for Easy Chicken Jambalaya. I found the inspiration for this recipe in a Better Homes and Gardens Skillet Dinners magazine and thought it looked delicious, and I was able to make it with cauliflower rice, rather then regular rice. Which makes this a delicious keto friendly, gluten free, grain free, low carb alternative. Yum!!! It came out amazing and was super simple to make. It took about 45 minutes total, including prep and cooking time. 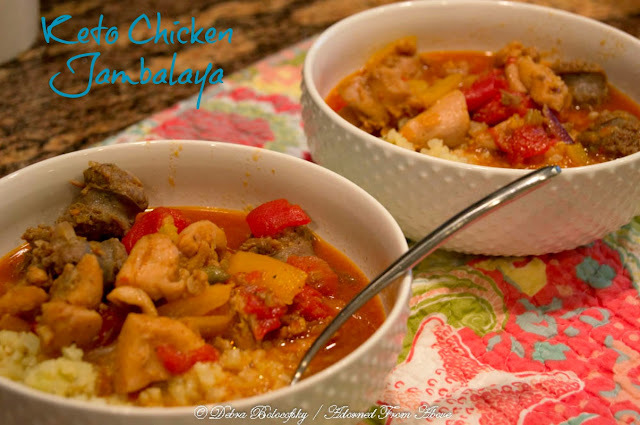 The flavors were delicious together, and I love when a recipe has fewer then ten ingredients. I know you are going to love it just as much as we did. Put 4 Tb Cajun seasoning into a bowl and add the chicken pieces and toss them to coat well. Heat olive oil in a pan over medium high heat and add chicken and andouille sausage and brown for 5 to 10 minutes. It took me about 10 minutes. Next, add the peppers and onion, cook for another 5 minutes. Then add to stewed tomatoes, stir and cover pan with a lid and cook for 10 minutes. I know you are going to love this recipe. I always love hearing from you, and would love to know how you like it. I wanted to show you this set of jewelry that I made recently with Chalcedony, Malayasian Jade, and Aventurine. I decided to use sterling silver wire for the necklace and bracelet, since I was using semi precious stones. I used for 14 kt gold wire for the earrings, since my ears are allergic to silver. I also used some silver beads for interest. 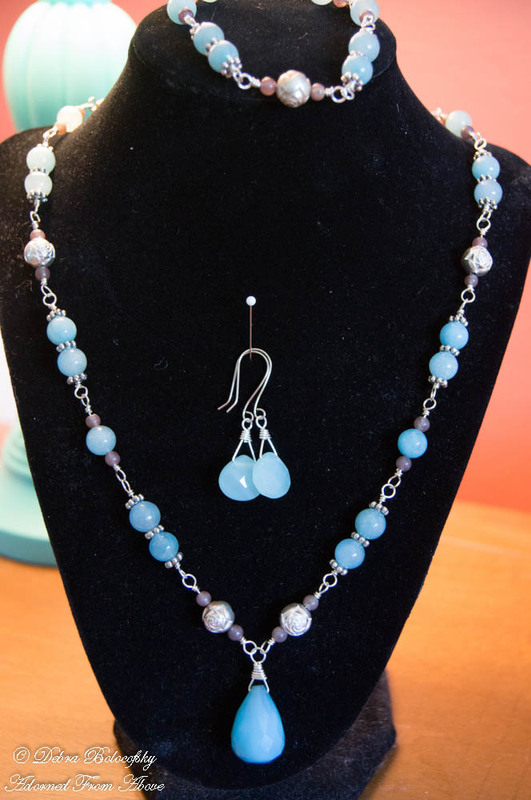 I chose the colors for this necklace, because they remind me of sea glass. Several months ago I was at the bead store, and saw all of the beautiful aqua, green, and yellow colored stones, and thought they would make a great spring and summer collection of jewelry. Living a block from beach, creates a feeling of calm, and I wanted to reflect this in my jewelry designs. I really love wire wrapping, and it creates a strong base for these stones which are pretty heavy. I didn't want anything breaking or coming apart, so wire wrapping is the perfect medium for these beautiful semi precious stones. 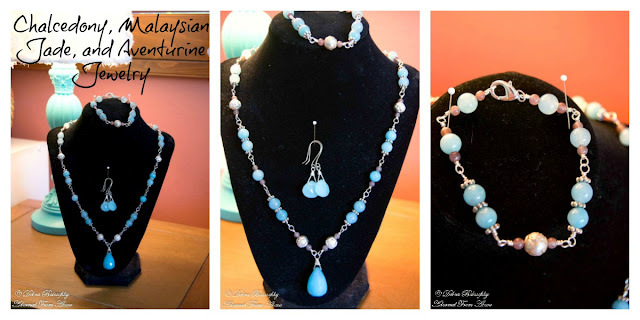 My favorite is the center piece, the briolette which is Chalcedony. It reminds me of the ocean on a clear, perfect day. I learned how to wire wrap Craftsy's Wire Wrapped Jewelry Making Class. I loved the class and the techniques are not difficult. I order my sterling silver wire and sterling lobster claw clasps from Fire Mountain Gems. You can Request a FREE Catalog for any of your supplies. This post contains sponsored links from Craftsy and Fire Mountain Gems. 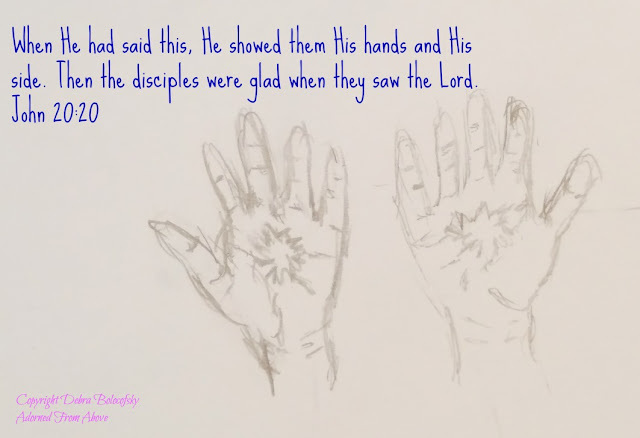 Thank you for having Jesus showing the disciples His hands. Mary Magdalene knew it was Jesus when she heard his voice, they believed it was Him when they saw His hands. Thank you for giving me the faith to know Him without any proof.